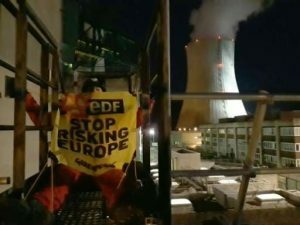 A group of Greenpeace activists broke into a French nuclear power plant on Tuesday, November 28 and scaled the walls of a building containing spent nuclear fuel to highlight security shortcomings at the facility. Around 20 activists took part in the latest stunt by the environmental campaign group aimed at showing that France’s 58 nuclear reactors are vulnerable to attack. 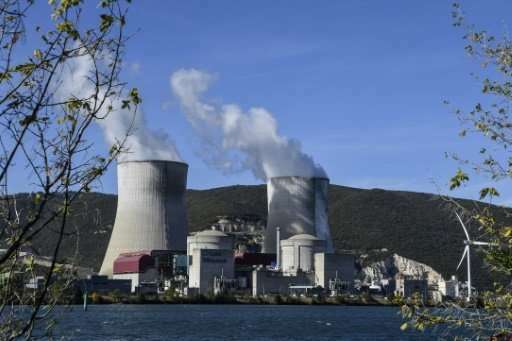 The group said the protest at Cruas-Meysse plant in the southeastern Ardeche region, which has four reactors, proved that security around spent nuclear fuel pools was particularly lacking. Four activists scaled one of the buildings containing pools used to cool highly radioactive spent fuel rods and set off flares. “All you need to do is make a hole (in the building) to start a fire,” Yannick Rousselet, Greenpeace France’s chief anti-nuclear campaigner told AFP. France’s state-owned energy giant EDF which operates the plant confirmed the intrusion but said that the plant’s safety was never in danger. Regional security officials said 22 people were arrested, adding they had posed no threat. The incident is the second of its kind in as many months. In October, Greenpeace activists got inside a nuclear plant in Cattenom, near the border with Luxembourg, and set off fireworks at the foot of a spent fuel pool. France is the world’s most nuclear-dependent country, with atomic plants providing 75 percent of the country’s electricity. Around a third of all reactors in the country are set to be closed by 2025 under a government plan to boost renewables. In a report in October Greenpeace noted that most of France’s nuclear plants were built before the rise of threats from non-state terror groups such as the Islamic State group and and Al-Qaeda and claimed that their defenses were weak.